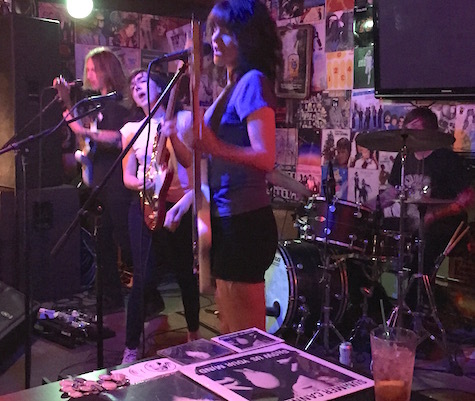 Summer Cannibals at O’Leaver’s, Aug. 21, 2015. They return to the club Saturday night. That description alone would be enough for me move onto something else, but when I listened to a couple of their tracks on Spotify I was intrigued. Their new album, Being So Normal, was originally released on Vancouver indie label Kingfisher Bluez. They kind of remind me of upbeat Pernice Brothers crossed with Susto. Strangely, there’s virtually no listing on Allmusic.com and not much else about them online, and yet tonight’s show at Slowdown Jr. is sold out, so the word’s gotten out about them somehow. Opening is Nashville indie act Sun Seeker who’s 2017 album Biddeford was released by Third Man Records. $12, 9 p.m.
Also tonight at fabulous O’Leaver’s: Advance Base is the project of Chicago’s Owen Ashworth (fka Casiotone for the Painfully Alone). The new album, Animal Companionship, is “about humans and their relationships with their pets: what pets mean to their owners and how those animal relationships affect our human relationships and vice versa.” Who couldn’t love that? This is a massive four-band bill with Philly act Friendship, Hartford/Focht and Mike Schlessinger. $7, 9 p.m. If that weren’t enough, punk legends Millions of Dead Cops (MDC) roll into Lookout Lounge tonight. Here’s a column I wrote about these dudes 13 years ago. Local punkers RAF and Top-Notch Defective open at 9 p.m. $15. Tomorrow night it’s back to O’Leaver’s for the return of Summer Cannibals. The Portland four-piece plays an infectious style of indie rock which sounds influenced by acts like Sleater-Kinney or Girl in a Coma. Their new album Full Of It is out now on Kill Rock Stars. This is yet another massive four-band bill with Hussies headlining, The Cult of Lip and The Natural States opening at 9:30 p.m.
And that’s all I got. If I forgot your show, put it in the comments section. Have a great weekend.